The system can realize fiber carding, accurate weighing and high speed filling. the most advanced weighing system, the operator can set the fiber weight with touch screen panel, fully automatic and accurate. The handling weight: 150g-1500g. More safety: The fiber carding machine has metal detector and overloading alarm system to avoid the machine being damaged. Cost-saving: Place an additional bale opening machine, it only needs one person to run the whole line. 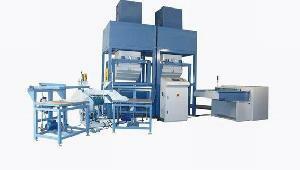 Two heads filling machine with patting devices ensure the high speed and top-quality filling.